Ah! I am with you now Stefan. We used to use cork sheeting at work for making gaskets. Both cork sheeting and Balsa would take glues and epoxies well. I think cork would resist compression more than Balsa. Interesting stuff. From memory the 'made for purpose' composite cores are very expensive as mentioned. Something to keep in mind with balsa is that it needs some sanding etc. before laminating on a curved surface, adding to cost and affecting consistency. This should be adequately taken care of with a cork core as you get it in sheets. Whilst the R&D is interesting and one learns much, I suppose its becoming pretty expensive by now. I for one am hoping to see the finished product soon! First some good news, we have made some progress with on the wood panels. The final programming to machine the mould that last one or 2 degrees was completed last week. So we now just waiting for a time slot with the 5 axis CNC machine. Hopefully, this will be the last round of refinement of the curvature of the mould. Since my last post, I have done some extensive search on balsa products that we can use as a core material. I know that Vivid uses balsa and build the core bit by bit as they layup the shell of the G-range( Pictures are on their facebook page if you scroll right down). However, I think this approach could time-consuming and could lead to inconsistencies as it requires a very skilled workforce. We want to standardise the process a bit more. Fortunately, I found a material from Europe that I also traced in SA that is made of a sheet of balsa blocks in varies grades and thickness. We are awaiting samples to do 2 carcasses with. The upside is that theses sheet are substantially cheaper than the Nomex Honeycomb material. We just want to look at how it drapes over the Vivace curves and how much resin it absorbs. It is certainly a good alternative to the more expensive kevlar product from DuPont. Here is a pic of the balsa sheet(not the specific one that we will use but it gives an idea of the way the blocks are cut, selected and then made into a sheet that can be draped around a radius). Yep, that's the same balsa sheets we for boat building in CT. I'm pretty sure I can get you in touch with some local expertise on the matter if you need it. Great, thanks Atjan. I think you might as well send me the details. My 2 months of travelling for work and family commitments are drawing to an end and hopefully, I will be able to drive our project a bit more in a concerted way forward and push our suppliers a bit harder. Maybe we have an approach of being the nice guys and therefore we get nowhere..
We are making small strides but it is really now getting to a point where we need more action on the bigger hurdles which is mainly timeslots in the production planning of our suppliers. In past few months(whilst travelling), I have also put my head down to try and think how we can "commercialise" the work we have done to a greater extent. I realise that the Vivace with all its complexities will be an expensive product, but hopefully, it will still be high on the value curve compared to the benchmarks that we have for the design. So I was looking at more scaled down designs that we still would be proud to make and offer to the market. I have in the past mentioned the Voce and small monitor design, sort of a small statement product and the Evocatuer, a high-efficiency design. These 2 concepts are alive and well and work have been done in this regard. However, both of these 2 concepts are still nice products and I believe a more affordable product that might have broader appeal and market segment is required. I will happily lend a "ear" to the prototypes. For the past few weeks, I was wracking my brain to give an update that would accurate, informative and speak of advances made. I still don't have the answer but in the absence of real news or a newsworthy post let me share what is happing in the background. We mostly have been busy with the management of our suppliers and it is not an easy task at all. I think to produce an MDF based speaker in a workshop and spraying it would now seem like a walk in a park for us now but to be reliant on specialist providers and working within their production plans are proving to be one hell of a task especially in the development phase. On the Aluminium side all is done and line up, also for future production parts. The carbon parts are also ticked and we are waiting for one more carcass to be trimmed and finished off. We hit a few snags with the port. Initially, we thought it would be best to mould it in 3 parts, i.e. inlet, knee and outlet but the 1st units we did in this way was not completely up to our standards. The joining of the 3 sections, even with a mould, leaves too much room for inconsistencies. Alex then figured out a way in which we can mould this part in one go and we re-machined the expensive aluminium mould to enable this way of producing the part. The money sunk into this mould alone would buy a pair of very good floorstanders... The 1st attempt with the new mould and process produced amazing an amazing quality part with perfect lines of the carbon fibre material deep into the throat, but to make one part took almost 6 hours and of course... push the cost of this part sky high....We now changed the process slightly and I hope to get feedback today or soon whether we made it more efficient without sacrificing the quality. The mid capsules are done and a reminder that there are 2 different units, basically a mirror pair. We still will experiment with a different core.. at the moment we have used foam as it draped well over the intricate profile of this crucial part. The story around the wood is the same.. we are in a holding pattern. I also have had discussions with our driver suppliers on advances and options, some of which are quite exciting. Nothing radical but evolutionary improvements and one or 2 liberating options on how the driver might be integrated into the baffle in the future. Alex and I are however restless creatives to our core and accepting the challenge on how to produce a more simplified design without sacrificing any of our core values have been keeping us motivated in the times that we had to wait for parts to be produced. We have found some exciting solutions on how to reduce the cost of the baffle, maybe ways we can improve the alignment of the acoustic centres of the mid and tweeter(not a straightforward challenge in itself) and we also have stretched our minds on the incorporation of leather/suede and felt and other exciting design materials. Strategically I have started to line up other suppliers with interesting spinoffs. A new world of options have opened up, I learned a lot about the advance composite world by talking to other specialists. Things like curing profiles, choice of resins etc helped me to feel much more in charge of the process and the black box of what is going on is far less of a constraint. It helps me to deepen the conversations with our current suppliers so that together we can find newer and better ways of doing things. 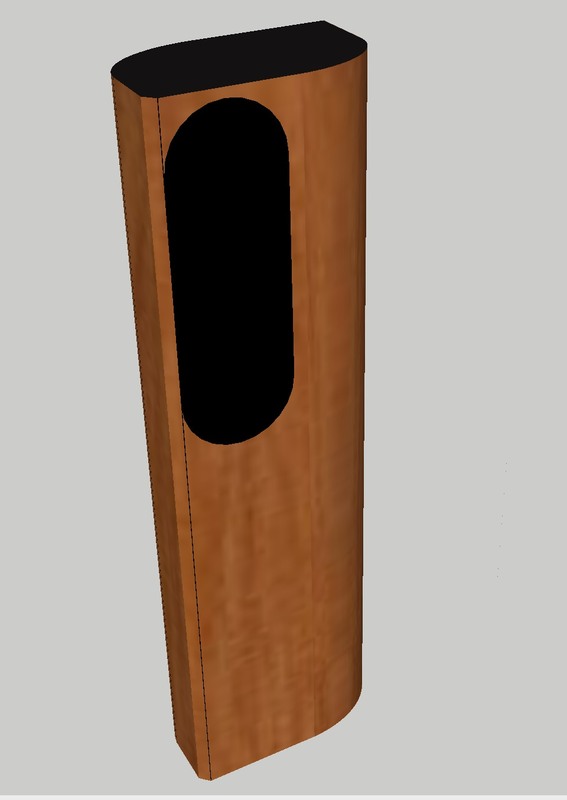 So our immediate goal is to assemble the 1st pair without the wood cheeks before the middle of Dec. Technically, except for the final dampening of the carbon carcass, we would be able to start to measure and listen to the speakers in almost its final form. We might clad the carbon with a cork layer instead of the wood.. we would be tempory only to test and listen. The pair will then be sent to me in JHB and hopefully, I can get cracking on the final voicing of the port tuning, and of course the crossover. My Xmas gift would be to listen to them despite their unclothed state. Obviously, that in itself would put a sweetener to a tough year of effort and a few big steps. If there are interested parties who think they have the ability to appreciate the quality of wine before it is matured, you can put your hand up, if you are in Jhb, you might get an invite for a short informal listening sooner or later of some parts of this project ..
^^^ I admire your perseverance. Commencing in 2015, with intention to bring to market in 2016, and now (possibly?) get to market in 2019. That's an extended journey! carry on the good fight will be well worth it in the end. There's nothing wrong with your system, you are just listening to wrong music on it. Thanks for updating us on your progress with this seemingly challenging journey.